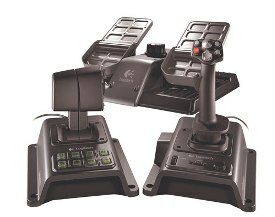 Logitech has just recently announced a new type of controller for flying games such as Flight Simulator and the like. As you can see, the G940 is designed to put the player in the cockpit as possible. After all, these controls were “inspired by commercial and military aircraft” and include a joystick, dual throttle, and rudder pedals. The joystick has a two stage metal trigger, along with six programmable buttons. As for the dual-throttle, it has a “split design for multiple engine aircraft with push button interlocks”. With these two controllers working together, the user has the option of up to 250 possible programmable button combinations. This means no more shifting from the mouse to the keyboard to get your plane to do what you want it to do. Of course, that does mean a lot of remembering what button combination does what. However, I have learned that Logitech intends for pre-designed labels to slip inside buttons. For example, the landing gear button will have a specific place. So, what have we learned here? A Logitech G940 Flight Controller plus a tri-fold screen equals one realistic flight gaming experience. If this is something that you want, you will have to wait until September to purchase the G940 for a price of $299.99.